This hostal has 2 floors in 1 building and offers complimentary parking nearby. Featured amenities include a business center, express check-in, and express check-out. Planning an event in Torrejon de Ardoz? This hostal has facilities measuring 2691 square feet (250 square meters), including conference space. Self parking (subject to charges) is available onsite. When you stay at Avant Torrejon in Torrejon de Ardoz, you'll be in the business district, within a 15-minute drive of Estadio Wanda Metropolitano and IFEMA. This 4-star hotel is 6.7 mi (10.7 km) from Plenilunio Shopping Mall and 10.1 mi (16.3 km) from Avenida America. With a stay at Hotel Madrid Torrejón Plaza, you'll be centrally located in Torrejon de Ardoz, within a 15-minute drive of Parque Europa and La Garena Plaza Shopping Center. This hotel is 9.2 mi (14.8 km) from IFEMA and 9.4 mi (15.1 km) from Estadio Wanda Metropolitano. For lunch or dinner, stop by El Chaparral, a restaurant that specializes in Spanish cuisine. Dining is also available at the coffee shop/café, and room service (during limited hours) is provided. Wrap up your day with a drink at the bar/lounge. Breakfast is available for a fee. Be sure to enjoy recreational amenities including a sauna and a 24-hour fitness center. This hotel also features complimentary wireless Internet access, concierge services, and a hair salon. Guests can catch a ride to nearby destinations on the area shuttle (surcharge). lastminute.com has a fantastic range of hotels in Torrejon de Ardoz, with everything from cheap hotels to luxurious five star accommodation available. 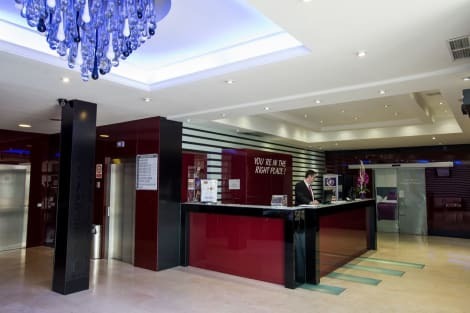 We like to live up to our last minute name so remember you can book any one of our excellent Torrejon de Ardoz hotels up until midnight and stay the same night.